UPSEE Entrance Exam 2019: In UPSEE Conducted through Engineering Entrance Exam for engineering, Medical and Management Which is affiliated to AKTU Abdul Kalam Technical University. 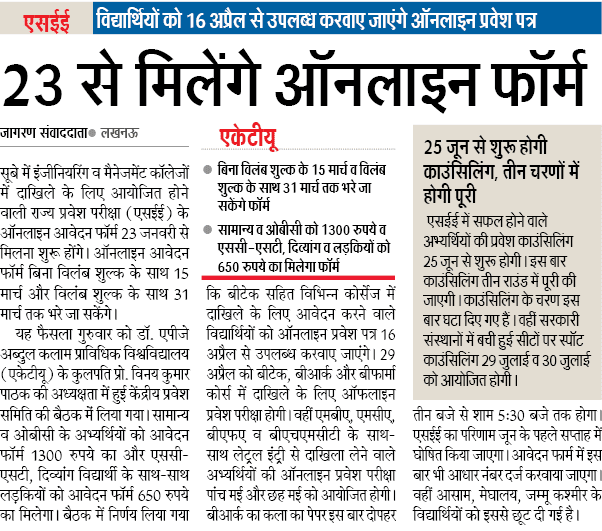 UPSEE Admission 2018 Latest news come and Exam date will be held in 5, 6 May 2019 which depend on course wise students. UPSEE Latest News: UPSEE has released the all notification which related to online application started from 23 January 2019 and Exam date is 5,6 May 2018 (according to Engineering and Management exam).Aadhar Card is Mandatory or compulsory for filling UPSEE 2018 Online form. Application Fee: Male & Transgender candidates of GEN & OBC category Rs. 1300, SC/ST/PH/Women Candidates Rs. 650. UPSEE Admit Card applicant can download their UPSEE admit card from the official website AKTU, UPTU University. UPSEE 2018 Admit card released on 7th April 2018. India Post office will not send admit card by post. Candidates can download their admit card for three purpose Entrance exam, counselling & admission process. Without admit card candidates will not allow to enter in the examination hall. UPSEE Result 2018: UPSEE Result posted on the official site in the 1st week of June. Candidates who have given successful exam in the entrance exam, will be separated merit list will be prepared for every course. On the basis of the merit list candidates will be called for the counselling process. UPSEE Counselling: 25 June period after the result announcement of UPSEE, the counselling begins will be started according to rank predictor, State wise. Only successful candidates with good rank 1 to 20,000 will be able to join in 1st and 2nd counselling procedure. UPTU Admission Criteria 2018:- Procedure to First Year in B.tech, B.tech (Agriculture Egg. ), B.Arch., B.Pharm, BHMCT, BFAD, BFA, MBA, MCA, MAM and 2nd Year Lateral Entry is also available in B. Tech/ B.Pharm./ MCA. Aadhar card: If you are applying for UPSEE Admission 2018 than you should have Aadhar card before applying for UPSEE 2018.If you have not Aadhar card than you are not able to apply online. Diploma in Engg./B.Sc. for 2nd Year of B.Tech. Diploma in Pharmacy for 2nd Year of B.Pharm. UPSEE Application Fee the for is Rs. 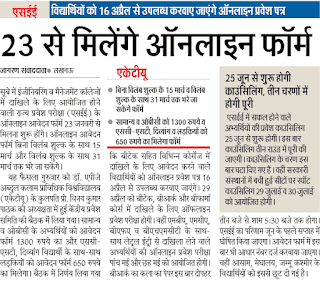 1300/- for Male candidates of General & OBC category and Rs. 650/- for Female candidates of all categories and SC/ST candidates. so as to reach, on or before 31th March, 2018. How to apply: On-Line application form submission consists of following three simple steps.